Tesla.. Tesla.. Tesla..One of my favorite stocks but I had to let it go for the forseeable future. Sold 5 shares at 223$ when support level 1 did not hold at 227. Wish I had sold it around 260.. but then again this is the market, you will always second guess yourself. I picked up FITX shortly after open at 85, 88. Picked up UTRM at 11. Holding till Friday will make further decisions as UTRM has big news coming out on Friday. FNMA- Regular Day. High Volume Yet no movement. 13million in volume yet the stock only moved .85%. 3/4 last night’s penny picks!! To view Monday’s Picks Click Here UTRM had another HUGE day !!. 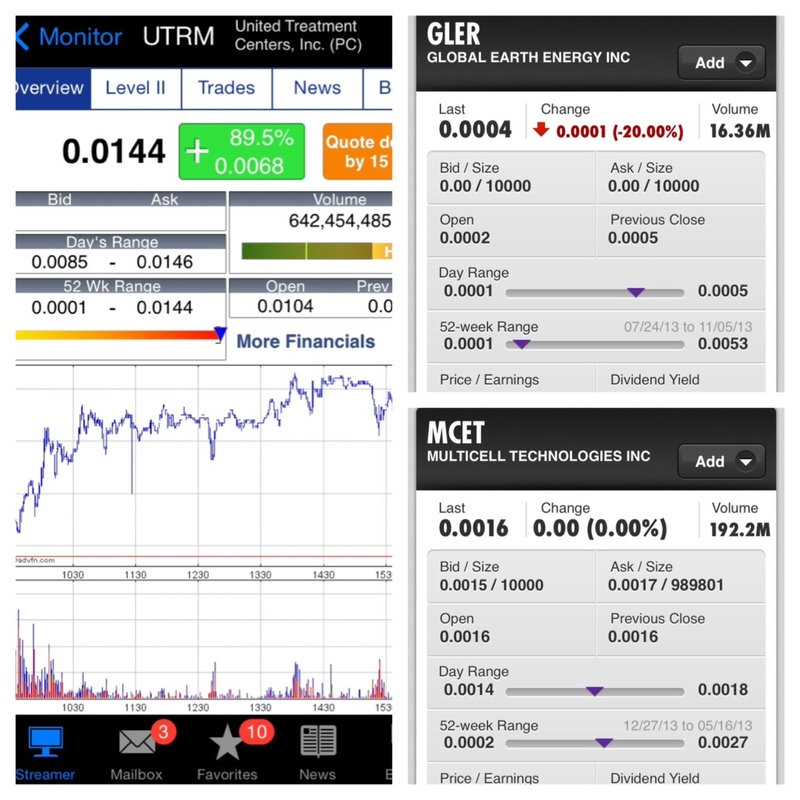 GLER opened at .0002, Finished the day at .0004 and had a high of .0005, MCET opened at 16, had a low of 14 BOUNCED up to 18 !!! Congrats if you played the trends perfectly ! You are becoming a better trader every day ! Analysis on PLUG,FNMA,TSLA, For our Reasonings Behind FNMA click here, For Reasonings behind PLUG click here, For Reasonings behind TSLA click here . PLAYS for OPTION TRADERS!! Stock Options – V , MA , TWTR Analysis !! Click the link for Cortes’s Detailed Analysis on Verizon , Mastercard & Twitter!! LONG TERM PENNY PICKS- MYEC, HYSR, Marijuana Stocks ( UTRM, FITX, MJNA, PHOT, TRTC, HEMP, CBIS, MDBX) For our detailed analysis on the future of Marijuana Stocks click here ! Day Trading Penny Picks! *UTRM* I hardly repeat penny picks on Back to Back days but this stock is on an absolute TEAR!! UTRM could possibly be the CNN of Marijuana. To monitor the feel for UTRM right now check out http://investorshub.advfn.com/United-Treatment-Centers-Inc-UTRM-7394/ ( Board Where You Can Get A Feel for the Stock ). Other Day Trading Picks Are – STBV, NOHO. All our day trading penny stocks are based off technical analysis. Our unique methods have a success rate of 83% ! Do not forget that the odds are against us mainly due the fact that timing is key and our penny picks change day in and day out. When trading our very own penny picks, the average holding time is about 30mins to 3 hours!. We are In and Out!!. To follow our every move follow us on twitter Hereitfirst_ Remember guys most of my penny picks are for day trading so you should be in and out!. Picks are all technically driven, I PLAY THE TRENDS not the stocks fundamentals. If the ask of one of my penny picks is beyond reach DO NOT CHASE! Live to fight another day.